I too am a fan of fresh bacon. The cooking process you are describing is kippering. 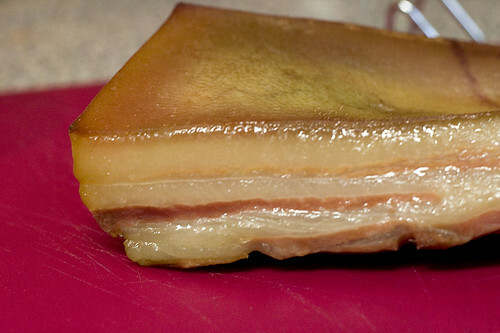 Most commercial bacon and other smoked meats use this process although they call it smoking because they use a smoke machine to produce smoke for the purpose giving the meat a darker color. 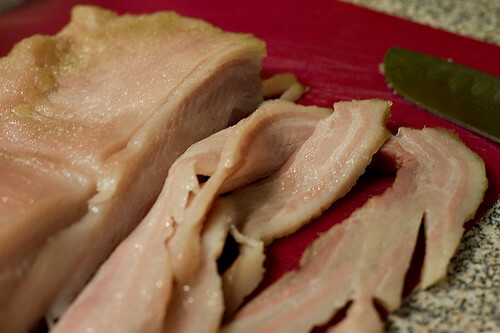 The flavor of smoke often comes from liquid smoke added to the brine. I mention this because many people think they can’t cook their own smoked meats. The oven does a fine job however. I like the variety of your recipes. Thanks for the information. I didn’t realize that most bacons aren’t really smoked. I wonder about the “higher-quality” bacons out there. I’m actually trying to come up with a method for stove top smoking. I think I can just use a dryer vent to vent the smoke out the window. I just worry about setting off the smoke alarm repeatedly. There are many ways to process “smoked meats”. I used to run a small meat shop and am familiar with some of the basic processes. Hence the info on kippering. I am hoping to do a bit of research on a few of the other ways to make various meat products for a series of posts on the subject. It will be a while before I get that done but it’s on the horizon. I’m not sure if cooking on the stove top will give you better results than the oven. You may also have a problem with the smoke you are venting attracting some unwanted attention, not just setting off the smoke alarm. If you have a vent for the stove top that vents outside, that could be tapped into. Also the smoky smell is very persistent. You may not want that aroma around all the time. Yes, there is certainly someone out there who would say their smoked meat is really smoked not kippered. I think most people, on the face of it would call kippering smoking. The smoking process, however, uses wood and depends on the smoke as well as some heat to cook and preserve the meat. Kippering uses heat to cook the meat, is quicker, and uses smoke for cosmetics, if at all. I don’t think most people would notice the difference between meat cooked these two ways. Anyway, keep up the good work. I’ll be keeping an eye on what your up to next. I may have to try something like that. My only worry is that we have a rather sensitive smoke detector and our ventilation isn’t quite that good. You folks can get a small electric smoker. They are inexpensive and do a great job. Regulating temp can be ab issue but with some practice you’ll get it. 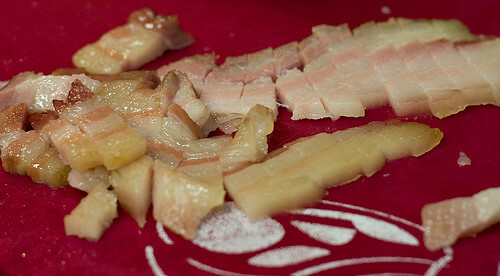 I make bacon in a dry cure salt and sugar mix. We use it very successfully as lardons but it’s hard to slice. I’m going to look at the electric smokers as we have enclosed woodburners so no smoking possible. We have never precooked it though, sounds interesting.